Hi…I live in Hawaii and my husband bought bunches of Sayote greens! What can we do with them? Any recipie ideas? never had boiled sayote. 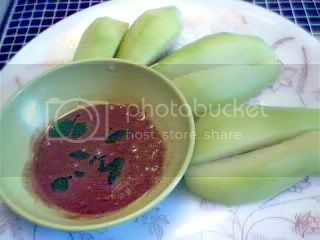 with bagoong — now that’s a wonderful combination! Hi Jonny! You should try it, it is as good as it looks, it has a very clean, refreshing taste. Ting, I did try doing that one time, but it just either shrivelled up or rotted. I think they are older than we are used to in Baguio, or not mature enough yet. These hardly have any seeds either, so maybe they are not mature enough to sprout. JMom, if the sayote is left for a long time even just in your vegetable crisper (in Baguio anyways), the sayote would “sprout” with leaves? ‘ever tried doing that? Hmmm, I’ll have to try it! Looks good! Ako rin, manang, I haven’t seen seeds or seedlings for sayote yet. Luckily, they started carrying them at the local grocery stores here. Pero, hindi parin kasing sarap ng galing sa atin, mas fresh kasi sa atin eh, you just go in the backyard and pick some. And these must have been hybridized varieties because they have no thorns, they are smooth as pears. Some people actually mistake them for pears.